We all love reading good blogs and many of us enjoy writing them too. 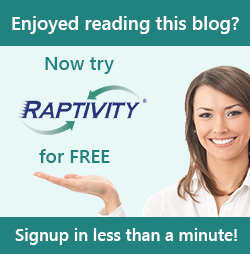 Raptivity team recently received a query from a prospect asking if he could use Raptivity to make his blog post interactive. That was an interesting thought. We have typically seen blogs that are textual or at the most with couple of stock images but never thought of them as an interactive content piece. This inspired me to try experimenting with this idea. I picked a blog by one of our Interactive Learning Thought Leaders, Desiree Pinder. In this blog, Desiree had shared the ‘Top Writing Mistakes in Storyboards’, and some useful tips to fix them. I selected a few Raptivity interaction templates that suited the content and ideas and simply customized them using the actual blog content. Then I quickly connected those interactions using Raptivity Linker. Result? A personalized interactive blog! Click on the sample below to see how a textual blog was transformed into an interactive one. Interesting, isn’t it? Do share your thoughts through comments below.